Nathan P. Gilmour , 26 September 2014. Now imagine that I ask you to point to Bob. No, actually, point to Bob. Good! Now point to rectangle, as distinct from Bob. Now point to red, as distinct from rectangle. Now point to digital image, as distinct from red. Head swimming yet? As with other parts of Philosophical Investigations, there’s no moment when the author pops around the corner and gives us the magical sword with which to slay this linguistic monster; the point is to appreciate the fact that language is a complex and interesting enough happening that it rewards continued attention and study. In one of his marginal notes (reproduced between sections 28 and 29 in the recent Wiley-Blackwell edition of Philosophical Investigations), Wittgenstein even points out instances in which pointing to something that is not-category could serve as a mode of training one’s neighbor to see it. (Think of a mathematical exercise in which the teacher points to a series of five shapes, the last being a circle. By pointing to the not-circles, the teacher hopes to establish some groundwork for understanding what a circle is.) No uniform rule regarding tone-of-voice, kinds of hand gestures, relationships between speaker and hearer, or anything else will eliminate the complexity, yet the system is not simply infinite: the possibility of naming and pointing to a mistake, then correcting that mistake, means that anarchy is also an inadequate metaphor. Another riddle that Wittgenstein poses and considers is the persistence of names and how that reality relates to the persistence of things-named. For his example here Wittgenstein asks us to consider Nothung, Fafnir’s legendary sword from Wagner’s Ring Cycle (39). How the sword functions in the story is unimportant; the question here is what “Nothung” names if somebody breaks the sword into several pieces and scatters those pieces. Does “Excalibur has a sharp blade” (I had to change sword-names in our last meeting so that folks wouldn’t confuse “Nothung” with “Nothing”) mean anything, since “Excalibur” doesn’t actually exist except as a whole? Clearly the “meaning” hasn’t died, because if the meaning stopped existing, the sentence would be nonsense instead of merely untrue. Thus the metal artifact that King Arthur used to carry around is not exhaustively the “meaning” of “Excalibur” but rather the bearer of that name, one possible meaning but neither the exclusive meaning nor a non-meaning (43). Thus certain words, like “this” (45) are neither meaningless nor names; whatever work they do, they’re still language but not names. As I told the students (and to some extent the faculty) present, such an insight might seem unworthy of calling insight, except that it does provide room for theories of language that don’t make “naming” their governing theory. If we’re still having our conversation about what language does and how it works, the question of “this” is actually quite important. Returning to names, Wittgenstein wonders what it means for objects to be simple or complex. The negative definition of simplicity is ultimately easier to imagine than a positive one: whatever is simple is not complex, and whatever is complex is not simple (47). But that’s where the easy parts ends. After all, to point to a checkerboard is obviously to point to something complex: the board consists of sixty-four squares, half of a different color from the other half. But even each square is complex if one thinks hard enough: the board could consist of wood or cardboard; decals or paint or stain; fibers of whatever material the board is made of; molecules of all of the above; atoms of the molecules; and so on. Or, to put it another way, each square is a color and a shape and a role the square plays in a game of checkers and the home (or not) of a checker of this or that color, and so on. But don’t get ahead of yourself (a persistent lesson one learns while reading Wittgenstein). After all, if I tell someone to look for two men sitting next to a checkerboard, someone who objects and says that there are no checkerboards, only complexes of colors and shapes and such, is going to be missing the point. In other words, to talk about objects as simple (or “simples,” to use a plural form that appears in Philosophical Investigations but still looks weird when I type it) is something that happens routinely in language as we actually use it, even if the possibility persists that, when we talk in a different way of the same subject matter, that same simple thing becomes a complex entity. In other words, even a thing’s simplicity or complexity depends upon complex but finite linguistic systems, and explanations of those simple and complex entities rely on the words already operating in that system, yet there’s often (even if not always) room to say that one has spoken imprecisely within a system (48-49). Thus the final part of last meeting’s discussion, the mistake. First, it’s worth noting that to point to “mistake” as one would point to “Bob” above (scroll up–he’s still there!) also assumes a complex but finite network of “moves” within the linguistic game. 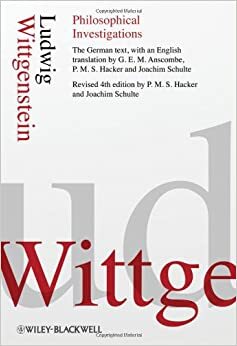 As with before Wittgenstein doesn’t offer one, simple rule to say what’s a mistake and what’s not; he merely points out the fact that, even in simple languages, there’s some ambiguity (but not utter chaos) with regards to what counts as a mistake and what is mere difference (51). As he moves ahead into other systems, he ends this meeting’s reading (which is an arbitrary ending point in one sense but ends precisely according to set rules in another) with an example from biology: a biological science that allows for the possibility of spontaneous generation will have to put procedures in place to make sure that any given mouse emerging from a pile of rags and dust was really generated rather than merely emerging from hiding among those same rags. A system that denies the very possibility of spontaneous generation, on the other hand, simply has no need to differentiate: everything that emerges must have been hiding (52). What’s the point of this? Well, come back next time, and perhaps we can think on it together!